As some may know, I'm obsessed over Hinata from Naruto. I've purchased as much fan-art of her from artist alleys around the US as I could. Official merchandise of Hinata is extremely slim pickings though so I'm basically stuck on having to resort to fan-made stuff at the moment. Something I really wanted is a custom dakimakura of Hinata. This is obviously something that would never be approved by the studio that makes Naruto. So I searched around both DeviantArt and Pixiv for an artist who has done dakimakura designs before, and were willing to take commissions. I eventually found an artist by the name of Tonee, and immediately fell in love with his art style. It was really moe and adorable, so I sent an email asking the price of the commission and giving a rough idea of the design I wanted. After some talks and sending him payment for the commission, after just four days, Tonee sent me this rough sketch of the design. I LOVED it! It was perfect! I replied to Tonee immediately and told him to proceed with the coloring, I could not contain my excitement. This image has been passed around the internet a few times now, it's gotten to the top rankings on a few imageboard websites. At first I was a bit worried about the design being passed around online, as I feared that some Chinese shop would re-draw the art and sell the dakimakura, making it no-longer special for me. But now I'm a little bit okay with at least the design being shown, as it means more traffic for Tonee. Okay~ so. Now that I had the design, I needed to get it made into an actual physical dakimakura. I searched around and found a service called Hobby Heart. I was a bit worried with this website, as I feared they'd reuse the design and sell it to everyone, which again, would make this feel less special :/ After about a week or so of debating it, I decided to give Hobby Heart a shot after they assured me that the design would not be re-used. After payment, and about 3 weeks, I finally got the pillow case in the mail. The quality was really good, I was impressed with how well it turned out. 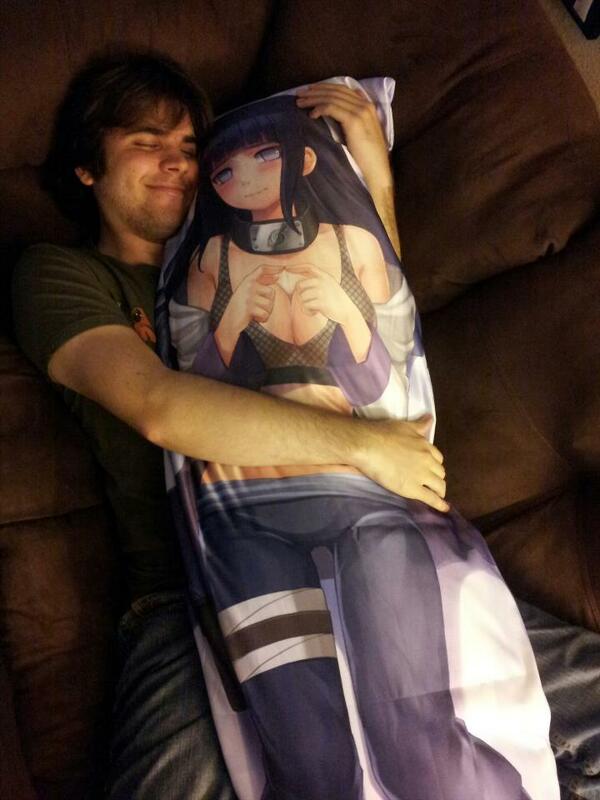 I was so happy to finally have my own Hinata dakimakura~! However, all was not okay... on 1/7/2014, while browsing around on some imageboards, I noticed a comment on the design of the dakimakura, apparently Hobby Heart had begun reselling the design, as well as a few of Tonee's other designs, to anyone who wanted it. I was so pissed, not just because my custom Hinata dakimakura was being sold to everyone, but because Tonee's amazing art work was being resold without his permission. I immediately contacted Hobby Heart and informed them that they were re-using this art without permission, providing screenshots of the original PSD files as proof. They informed me that a customer wanted the design for themselves, but that the customer didn't have the high-res file, so Hobby Heart's artists had to "redraw" the art. This is a lie, as they have the high-res copies in their possession. Despite this, they agreed to take down the Hinata design as well as the rest of Tonee's art work. I don't know how long the designs were made public, and the thought of it kind of upsets me still. I'm not sure if I'll be using Hobby Heart's services again after this issue... Despite the annoying side of this story, I still very much love my Hinata dakimakura :3 If any of you are looking to commission a dakimakura design, or even get some cute, moe, art created; I highly recommend checking out Tonee, he is a pleasure to do business with and is very professional. Update  - Hobby Heart has changed their name is Moe Market.